The government has said a contract to allow a new airline to take over route between City of Derry and London Stansted airports is expected to be signed later this week. Transport Minister Nusrat Ghani told MPs on Monday the government "expects services to resume swiftly". It follows the collapse of Flybmi, which had operated between the airports since 2017. The airline filed for administration and ceased operations on Saturday. Emergency talks began on Saturday evening between City of Derry Airport, Derry City and Strabane District Council - which owns the airport - and the Department for Transport. "The government recognises the importance of maintaining regional connectivity, that is why we fund a public service route from Derry/Londonderry to London which was recently extended from the 1 April 2019 for a further two years," Ms Ghani told MPs. She said the council had "the power to transfer the public service obligation contract to another airline for up to seven months to allow for a new procurement process to be conducted." "Subject to due diligence we expect the council to sign contracts and appoint an airline later this week and we are expecting services to resume swiftly," she said. The transport minister said the council would now "take forward that part, it is their responsibility." 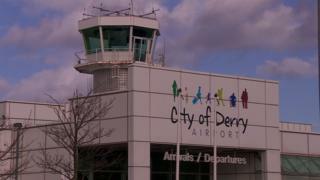 Earlier Clive Coleman, the contracts director at Regional and City Airports, which runs City of Derry Airport, said its "key route" was to London. "It would be challenging to run the airport without a London flight," he said. "A number of airlines contacted us saying they were interested. "We are in discussions with a number of them now and we've been working with the Department for Transport on that." Mr Coleman declined to reveal which airlines had shown an interest in taking on the route, saying the information was commercially confidential. Scottish regional airline Loganair has confirmed an interest in the route. A spokesperson for the airline, which runs a Glasgow route from City of Derry, said it had an "extensive track record of providing PSO (public service obligation) services and a strong understanding of the Derry market". "We look forward to receiving details of the tender process as soon as possible." Mr Coleman said it was "difficult to tell how long it would take a new airline to have the route up and running again". "It normally happens quickly - sometimes it can be a week but I don't want to be specific at this stage," he added. Flybmi said it had been badly affected by rises in fuel and uncertainty over Brexit. Flybmi operated two return flights each day, except on Saturdays when there was one flight each way. "Flybmi entered into this public service obligation route in May 2017 and that was a contract signed at that time - a two-year contract," Mr Coleman added. "The government announced on Thursday that it would continue to fund that for another two years. "It's unfortunate timing that two days later they announced they were going into administration. "It's in everybody's interests to get a new operator appointed as soon as possible." Staff at the airport "will be worried", he added. "We are working closely with them and they are being told what's happening. "We obviously still have other flights going out and coming in." Flybmi was an East Midlands-based airline, which had 376 staff, operated 17 planes and flew to 25 European cities. Passengers affected by its collapse have been told to contact their travel agents or insurance and credit card companies. Bronagh McCann, who has been living and working in London for seven years, said she used the flight to come home to the north west regularly. "I actually have flights booked for April," she told BBC Radio Foyle. "The route into Derry was so handy. When we fly into Belfast we are forever depending on family to drive us. It's just very inconvenient. "I thankfully booked my flights on my credit card so I should get my money back. "We would have used that flight five times a year and then for other family events too. It's terrible news for the region."